Summertime in Slovenia is always the right season for various picnic events. This Summer is no different. Every birthday of a friend or even a sunny weekend can be an excuse for another picnic. Locations of these events vary. Sometimes it's just a terrace by some friend's house and sometimes it's some remote place in the middle of nowhere. On one of the previous weekends one such event took place. To get there we had to turn off the local road and follow a macadam forest road full of holes for a few kilometers uphill and park next to a barn, just to continue on foot for another 20 minutes. These kind of places always make me wonder, what the heck were these people thinking to build a house in such a place? And how did they do it? If the pyramids are a World wonder, why not these places? It had to be a life project just to get all the building material to such a remote location. Our destination was an old deserted house, where the relatives of the guy who invited us used to live. Once again various barbecue meat and vegetable dishes were on the menu. Besides that the location was just perfect for relaxing and chatting with friends (and of course drinking a beer or two when doing that). The main barbecue dish was cevapcici (you can see it on the first photo). It's a traditional Balkan dish. I guess barbecues without those are quite rare in Slovenia. 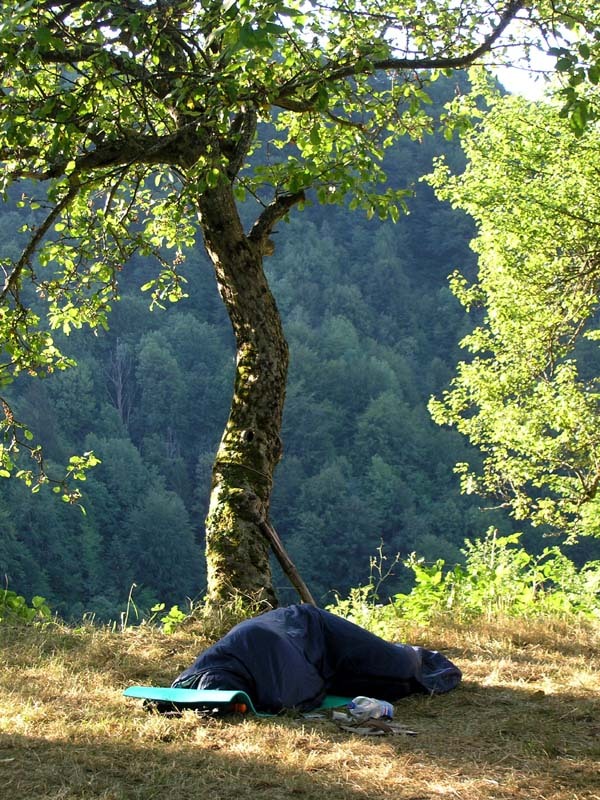 One could just lie in the grass and enjoy the peaceful atmosphere. There was also a net between two of the trees for the same purpose. Because the house is surrounded with trees, there is lots of wildlife around. A dormouse has made itself a home in one of the rooms on the first floor. At dusk and again at dawn deer come to feed on grass growing around the house. And occasionally even a bear is seen roaming in the neighborhood. It seemed like we were making way too much noise for any of them to come close. Except for the dormouse that is. It seemed like it went on a night shift and payed us back for the noise we were making through the day. For those of us who wanted to spend the night, there was lots of space inside the old house (not for the picky ones though) and outside for pitching tents. Some even took the option of a sleeping bag under the stars. Some of the guests were city folks and I could tell they didn't feel very comfortable when the night fell. At the end we all had a nice weekend event. Definitely a thing to do once in a while. Oooh, a picnic sounds divine. I love nice summer activities like that. That BBQ looked delicious- what kind of meat is that? Absolutely, if I was going to a remote place like that I would at least expect to spend the night. I don't know about sleeping under the stars but if I have a sleeping tent I would be OK. Seems to me you had a terrific weekend. 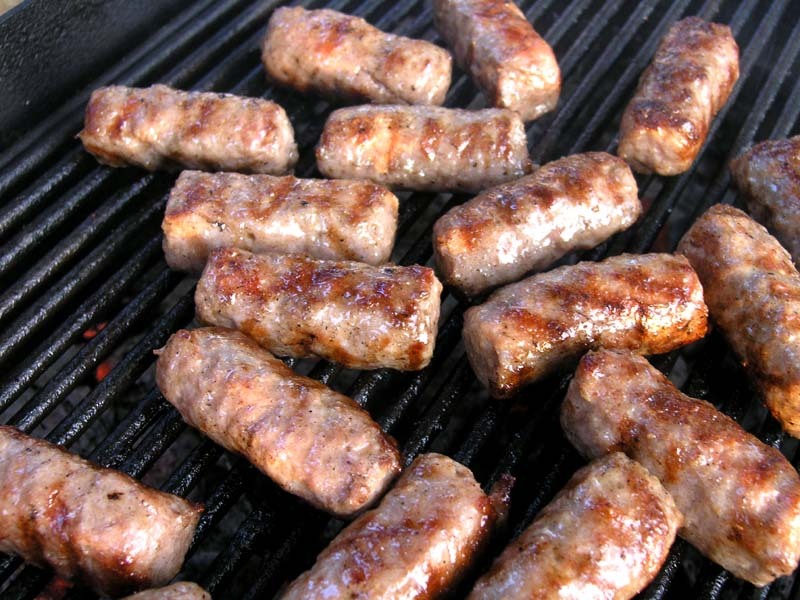 Cevapcici are made of grind pork and lamb or pork and beef. Of course you also have to add some finely chopped garlic, salt and pepper. I definitely had a blast! Some peace and quiet does me good once in a while. That hammock pic is awesome.